Broadly speaking, then, the amount of sleep we need each night decreases steadily throughout our younger years up to adulthood, when it flattens out and remains more or less constant. The amount of sleep we actually get also decreases throughout life (see graph below), although for a variety of reasons sleep need and sleep achievement are not always synchronized. Younger children tend to a have a much higher arousal threshold, and can sleep through even quite loud noises, which helps them to achieve the long sleep periods they need. 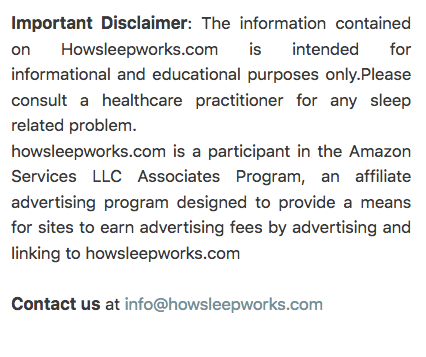 For social and cultural reasons (as well as physiological reasons – see below) teenagers and young adults typically sleep substantially less than optimal amounts, and as many as a quarter of all college students are chronically sleep deprived. Shift workers, doctors, truck drivers and young parents are also at particular risk of sleep deprivation. Contrary to popular belief, the elderly actually need just as much sleep as younger adults, but they usually find this difficult to achieve (for a variety of reasons including the side-effects of medications, pain-related medical conditions, respiratory problems, etc, all of which are more common in older people), and their night sleep is typically lighter, shorter and more fragmented, often driving them to resort to afternoon naps. 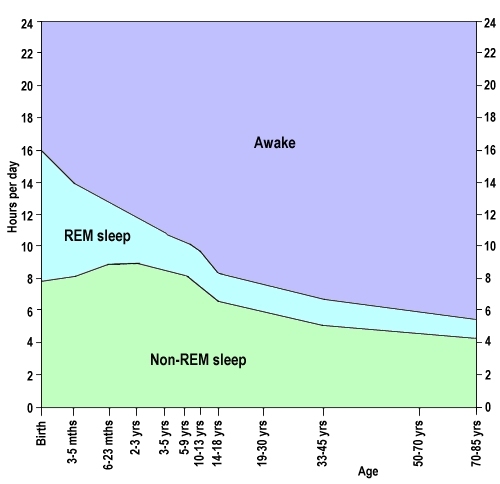 The make-up of our sleep – in terms of non-REM sleep and REM sleep – also changes throughout life (see diagram below). For example, a newborn baby may need anywhere from 12 to as many as 18 hours of sleep a day, of which fully half may be spent in REM sleep (in the unborn fetus, this percentage can be as much as 80%, although muscle atonia has not developed by that time, perhaps because the fetus does not need protection in the womb). By the time they reach school-age, children may need around 10 hours of sleep a day, but only 2 hours or less of this may be REM sleep, an amount which changes little as they continue to develop into adulthood. It is thought that the increased proportion of REM sleep in babies may be linked to the early development of their central nervous systems. In older people, the depth of sleep tends to decrease: the proportion of REM sleep may fall to around 15% or less, and deep stage 3 non-REM sleep also tends to decrease, making them more susceptible to sleep disturbances and also compromising their immune systems and leaving them more vulnerable to illnesses. 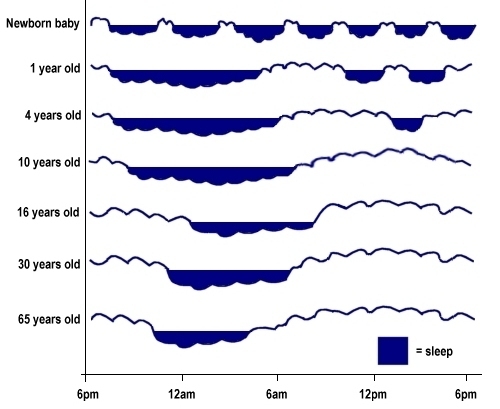 The timing of sleep is another aspect that changes as we age (see diagram below). Newborn babies do not yet have fully functional circadian clocks, and the sleep of newborns is typically split up into 3 or 4 hour periods throughout the day and night (polyphasic sleep), mainly dictated by the need to feed. 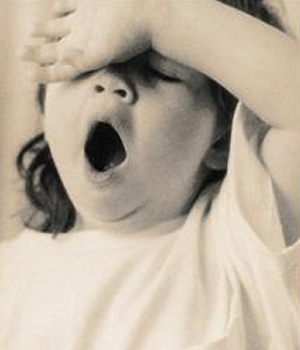 As they get older, a longer sleep period during the night emerges, combined with one or two naps during the day. Ultimately, the daytime naps are not needed, and a normal nighttime sleep regime is established. During adolescence and the teenage years, there is usually an unexplained phase delay of at least an hour or two, so that teens naturally feel more alert later at night and find it difficult to wake up early. Typically, they may not be ready for sleep until 11pm or 12pm, and not ready to wake again until around 9am, which clearly does not fit well with the usual regime of parental rules and school hours. Given this, it is perhaps not surprising that many teenagers are prone to mood and behaviour difficulties – sometimes misdiagnosed as attention deficit hyperactivity disorder (ADHD) – and it has been shown that even a modest delay in school start times can allow teenagers a more natural sleep profile, and can significantly improve both academic performance and behaviour. After the age of about 55, the pendulum swings back the other way and older people are subject to a phase advance, and tend to be ready to sleep earlier in the evening and wake earlier in the morning.